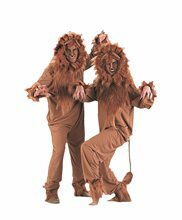 Lion Adult.Includes: Lion jumpsuit and lion headpiece.Available Size: Adult - Medium, Adult - Large. *Face Make-Up and Socks Not Included.Care Instructions: Hand wash cold and tumble dry low.Show your courage in our cowardly lion costume. Your pals will be ready to seek out the wonderful wizard with you when you arrive in this furry lion jumpsuit with matching headpiece. 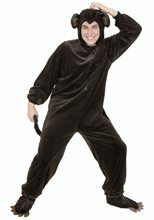 Monkey Adult.Includes: Jumpsuit, headpiece and shoe covers.Available Size: Adult - Small, Adult - Medium, Adult - Large, Adult - X Large.Material: 100% Polyester.Care Instructions: Dry Clean Only.Get into some serious monkey business in this Monkey Adult costume featuring full body jumpsuit, monkey ears headpiece and monkey feet shoe covers.Pair up with a banana for a perfect couple's costume! 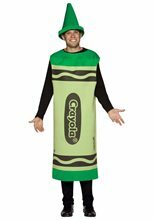 Operation Adult Costume.Includes: Body suit and character mask.Available Size: Mens - Medium (42-44), Mens - Large (46-48).Material: 100% Polyester. *Shoes Not Included.Care Instructions: Hand wash cold, wash separately, Do not iron, Do not bleach, line dry, Do not dry clean.Become the character from your favorite childhood game in this Operation body suit that matches the game's main character and mask! 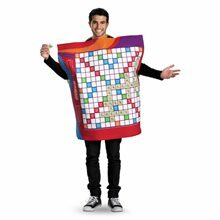 A truely original costume that will wow all of your friends! 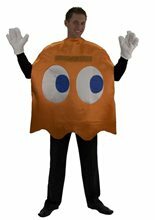 Pac Man "Blinky" Deluxe Adult Costume.Includes: Costume and Gloves.Available Size: Standard - One Size Fits Most Adults. *Shirt, Pants and Shoes Not Included.Features: Red Blinky pullover to wear on your shoulders or over your head.A-maze-ing! Add a nostalgic touch to your next costume bash in this Blinky costume! Perfect for Halloween or any 80's flashback party. Includes a red ghost bodysuit that can be worn on your shoulders or over your head for maximum impact. Also includes coordinating gloves. 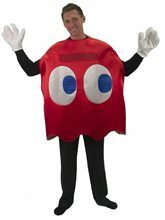 Pac Man "Clyde" Deluxe Adult Costume.Includes: Costume and Gloves.Available Size: Standard - One Size Fits Most Adults. *Shirt, Shoes and Pants Not Included.Features: Orange "Clyde" pullover to wear on your shoulders or over your head.That tortoise may have been onto something. It's slow and steady that wins the race when you're this pokey ghost of arcades past! Get a kick out of this nostalgic Clyde costume! Perfect for Halloween or 80's flashback parties! Includes one orange ghost bodysuit that can be worn on your shoulders or over your head for maximum old school impact. Also includes coordinating gloves. 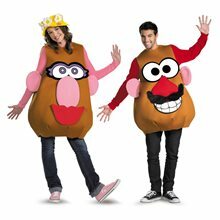 Dress-up as Mr. or Mrs. Potatohead in this Potatohead Unisex Adult costume featuring one overlay with set of detachable male eyes, nose, moustache, mouth and set of detachable female eyes, nose, lips and hat.Potatohead Unisex Adult.Includes: One overlay with set of detachable male eyes, nose, moustache, mouth and set of detachable female eyes, nose, lips and hat.Available Size: Adult (42-46). *Shirt, Pants, Shoes and Bonnet Not Included.Do Not Wash. Do Not Bleach. Do Not Tumble Dry. Spot Clean with Damp Cloth. Cool Iron If Needed. Do Not Dry Clean. 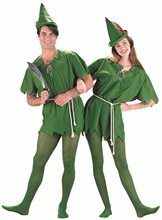 Robin Hood Unisex Adult.Includes: Green & brown trim tunic, black belt, matching hat, green leggings, green & brown trim shoe covers.Available Size: Adult - Small (36-38), Adult - Medium (40-42), Adult - Large (42-44). *Shoes, Pants, Fishnets and Weapons Not Included.Care Instructions: Machine wash cold and hang dry.Material: Polyester blend.You'll certainly be stealing hearts in this swindling Robin Hood costume. Your merry men will be eager to share their bounty when you surprise them in this green tunic with castle stone trim, matching tights and feathered cap.